Do you often wonder if the products in your refrigerator are still fresh, or if the can of food you “forgot” in the back of your cupboard is still good? Or, do you wonder if you should buy the last ten cans of almost free soup at your stores’ clearance sale? If so, here are some tips and recommendations compiled from leading manufacturer and government sources to help you sort out your refrigerator, freezer, and pantry shelves. Common guidelines are determined on unopened products stored under normal conditions: Room temperature is usually 60 – 70F, refrigerators are 40oF, and freezers are kept below 32F, or freezing. Once opened, or if the optimum storage conditions aren’t met, the shelf life will be less than these guidelines. Sell-by: Tells the store how long to display the product for sale. You should buy the product before the date expires. Best if used by date is recommended for best flavor or quality. It is not a purchase or safety date. Use-by: The last date recommended for the use of the product while at peak quality. The date has been determined by the manufacturer of the product. Closed or coded: These dates are packing numbers for use by the manufacturer. If perishable, take the food home immediately after purchase and refrigerate promptly. Freeze products if you can’t use them at times recommended on the chart. Once a perishable product is frozen, it doesn’t matter if the date expires because foods kept frozen continuously are safe indefinitely. Fresh: refrigerate in crisper or lose plastic, use within 2 days. 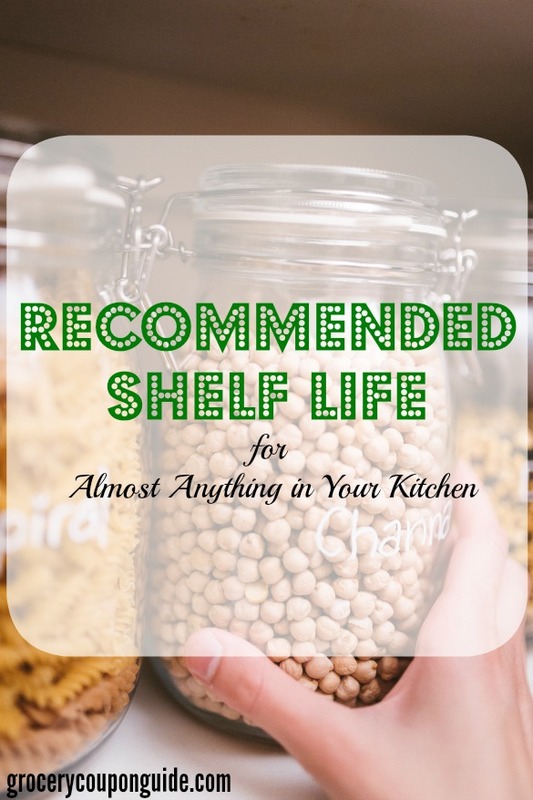 Shelf life can be increased by periodically removing moisture that accumulates. Frozen: sealed, up to 1 month; the Food Marketing Institute recommends that opened bacon never be frozen. Fresh: room temperature until ripe; shelf life can be extended by refrigerating up to 3 days, but the skins will become dark brown. Refrigerate: will limit formation of mold, but bread will go stale more quickly. After this date, the mix is still safe to use and consume, but there may be changes in product flavor, volume, or texture. Keep Frozen. If stored in the refrigerator, use within 24 hours or discard. Once baked, they can be stored in the freezer for up to one month. After baking, brownies may be wrapped tightly and frozen for up to 2 months. Fresh: refrigerate 1 – 2 weeks; will keep several days past expiration date on the package. Frozen: up to 6 months. Packaged cabbage/coleslaw shreds (such as Fresh Express) may be frozen directly in the bag for later use in soups and recipes, for up to 2 months; place in freezer packaging for longer storage. Cakes with whipped cream frosting or cream filling must be stored in the refrigerator. Cakes with custard or fruit filling should not be frozen, as they become soggy when thawing. (The harder the cheese, the longer it will keep without deteriorating). Unopened hard and wax-coated cheeses: refrigerate for 3 – 6 months. Cottage and ricotta: up to 5 days. Shelf life in refrigerator or freeze: refrigeration or freezing extends the shelf life significantly. Some people believe that the flavor is altered once refrigerated or frozen. Store: refrigerate up to 3 weeks. Homemade: 2 days – 3 weeks, highly variable depending upon the type (crisp, moist, bar, drop, etc). Canned at home: up to 1 year is recommended. Honey will darken with age but does not spoil. Freeze: up to 1 month in store container; up to 1 year if repackaged or overwrapped to resist moisture vapor. Sugar-free, Fresh: Refrigerate up to 2 days, may become watery. Tips: Organic lettuces generally have a longer storage life, up to 2 weeks at room temperature. Shelf life at 70C: unopened, 2 months or longer, check expiration dates. Fresh, conventional: refrigerate up to 7 days, usually fresh up to 3 days after the “sell by” date listed on the carton. Frozen: not recommended, may become watery. Refrigeration: Dijon & Horseradish Mustard should be refrigerated after opening to preserve heat and distinct flavor. Refrigeration is not required for food safety of mustards. The shelf life of olive oil is variable, so smell and taste product to confirm freshness. Fresh: store at room temperature. Once ripened, use immediately or refrigerate up to 5 days. Dried: 6 – 12 months at room temperature. Freeze dried fruit for indefinite storage. Once baked, freeze pizza dough up to 1 month. Fresh: Prepared pudding can be refrigerated up to two days. Ready to Eat refrigerated pudding should be used within the “use by date” on the package. Canned: up to 12 months stored opened canned pumpkin in a sealed container in the refrigerator up to 1 week, or up to 3 months in the freezer. Tips: Certain oils are more delicate, and become rancid quickly. Refrigeration is not necessary but stores in a cool, dark place in a tightly sealed container. Can, unopened, store up to 2 years at room temperature. Sticks, sealed, store up to 2 years at room temperature. Store sour cream in the refrigerator up to 2 weeks (manufacturer recommendation). Canned at home: up to 6 months is recommended. Fresh: Refrigerate up to 7 days unopened.